It’s kind of crazy how certain scents can instantly evoke memories you’d completely forgotten about. The smell of warm chocolate cookies can transport you to that night you slept underneath the Christmas tree because your dad told you Santa and his reindeers will show up. Sunscreen and coconut oil can remind you of sunny days in Bali. And Jo Malone Lime Basil & Mandarin cologne might make you recall your ex-boyfriend’s….mom? 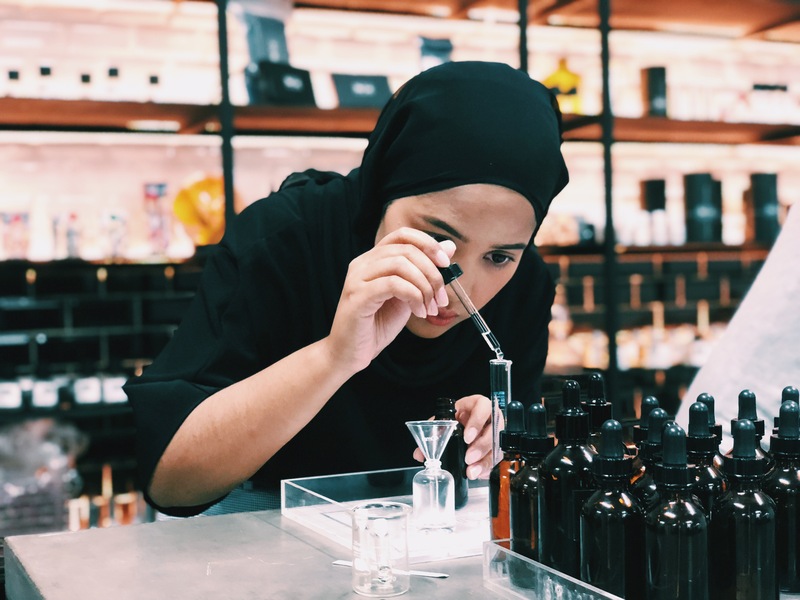 There is a plethora of brands out there offering fragrances but the downside is there’s always the chance you may end up wearing the same scent as someone else–especially if you wear a classic fragrance like Chanel No. 5. This is where Oo La Lab comes in. 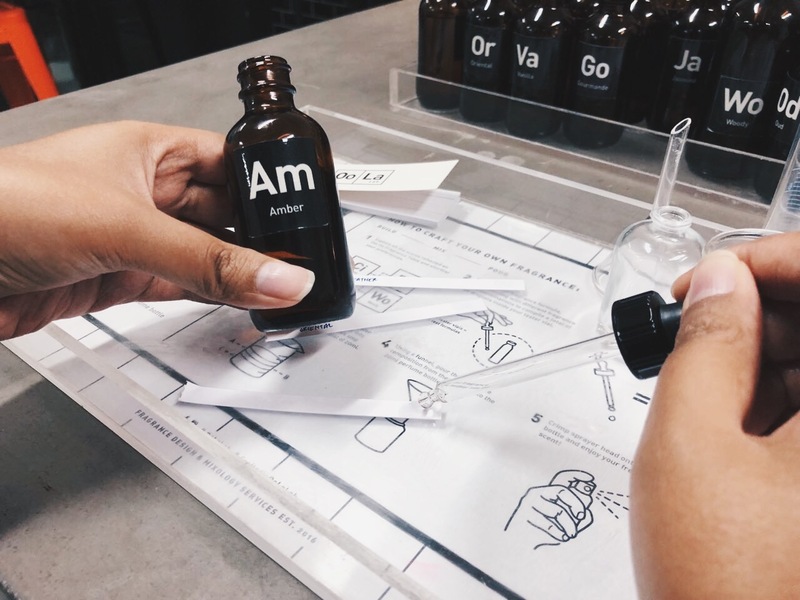 Established in 2016, this fragrance lab allows you to customise your fragrance with a mixologist to come up with your ideal perfume – from picking all the notes to choosing a name. 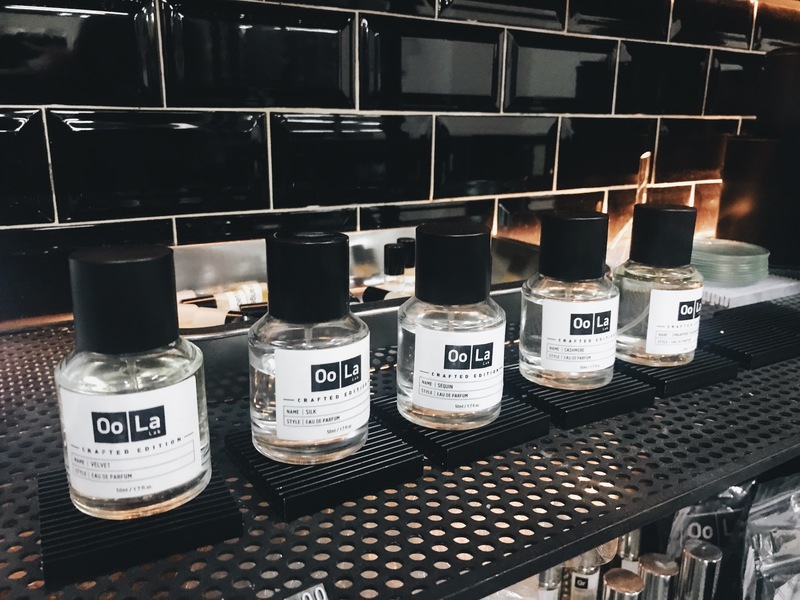 You’ll smell it before you see Oo La Lab’s workshop, their counters are lined with bottles of essential oils and perfumes. 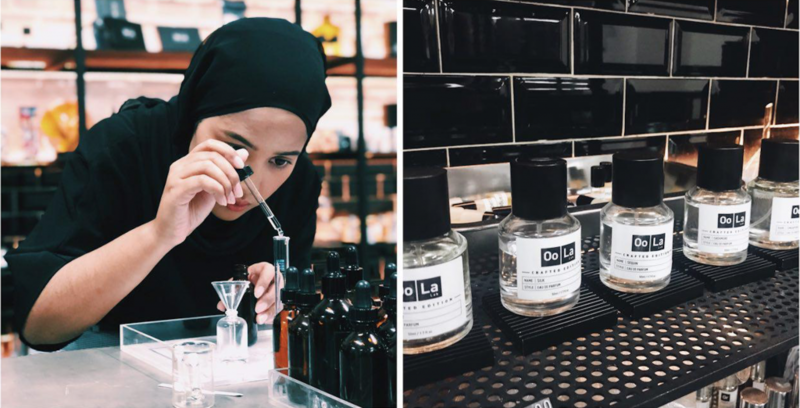 Located in Delta House, Oo La Lab lets you customise your own fragrance in a 60-minute perfume making session ($88/pax, $176/two pax). 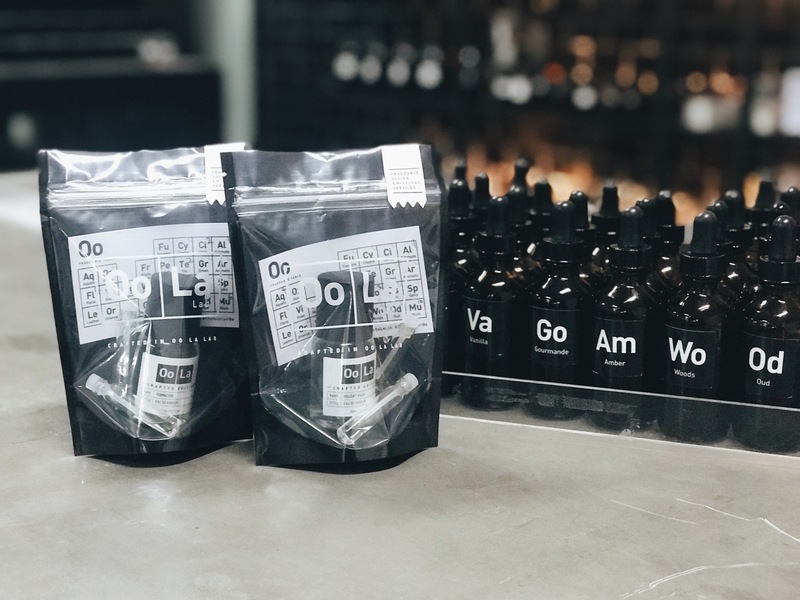 Starting with a quick theory lesson on the Oo Fragrance Table which has a total of 25 core scent and 2 complex scent available, we set out to start our perfume making process. The first step required us to take a whiff of every scent and narrow down our favourite ones. 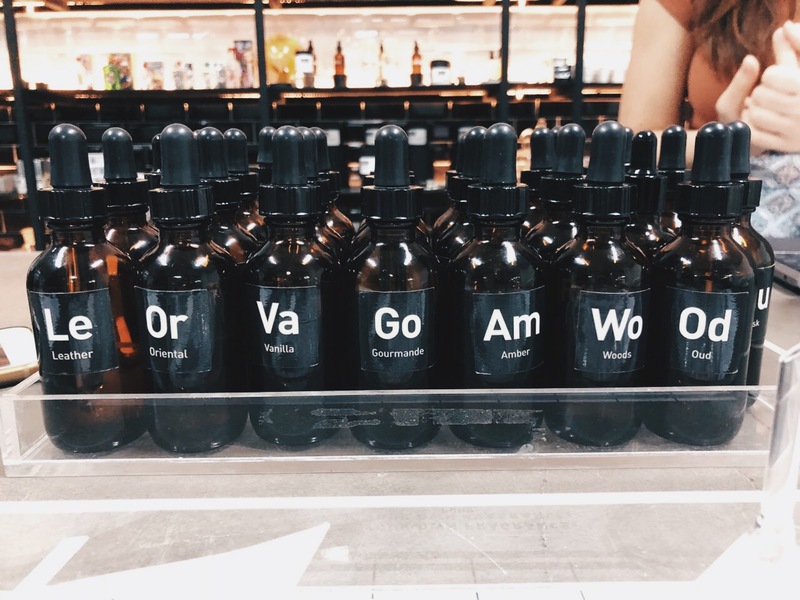 The scents were split up to 3 different categories (bottom, middle, top notes). Now, if you’re like me and you suffer from the butter finger syndrome, you’ll find yourself fumbling with the glass beakers, funnels and the bottles. Please don’t break anything. Please don’t break anything. PLEASE don’t break anything. The entire set up felt like a complete throwback to chemistry lessons in secondary school. All that’s left was a lab coat, goggles and gloves to complete my look. While I was halfway through smelling the different scents, I started getting a little giddy or perhaps high from all the different smells. The lab also carries “edible” scents such as Vanilla and Gourmande which honestly got my tummy rumbling. The aromas were so sweet that I was almost tempted to taste them. They also carry a limited edition synthetic scent called “Chocolate” which will remind you of a chocolate fondue. 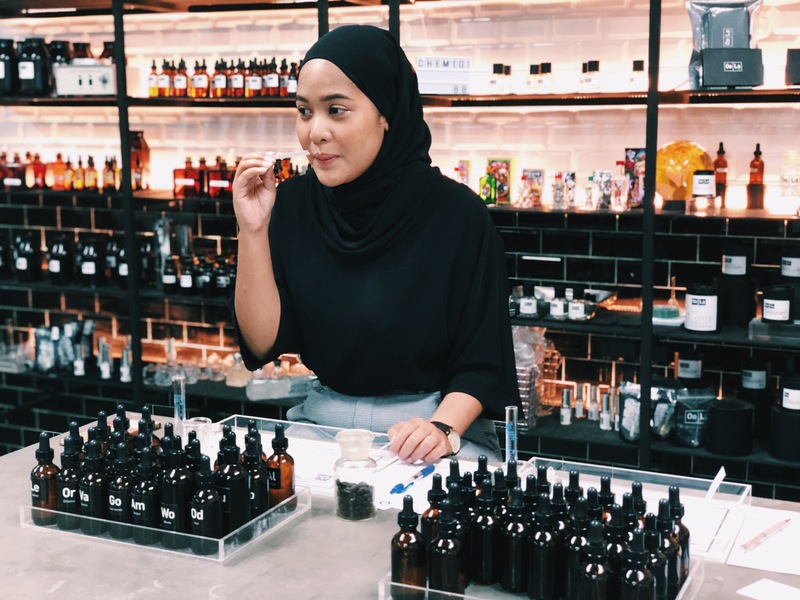 From Fresh and Floral notes to deeper Oriental and Wood fragrances, I had a tough time picking out the scents that would fit my personality. Once I’ve decided on my scents, it was time to do the math. I was allowed a total of 20 drops for each round (there are 2 rounds), which must include 10 drops of bottom and 10 drops of middle and top notes (5 from middle, 5 from top). 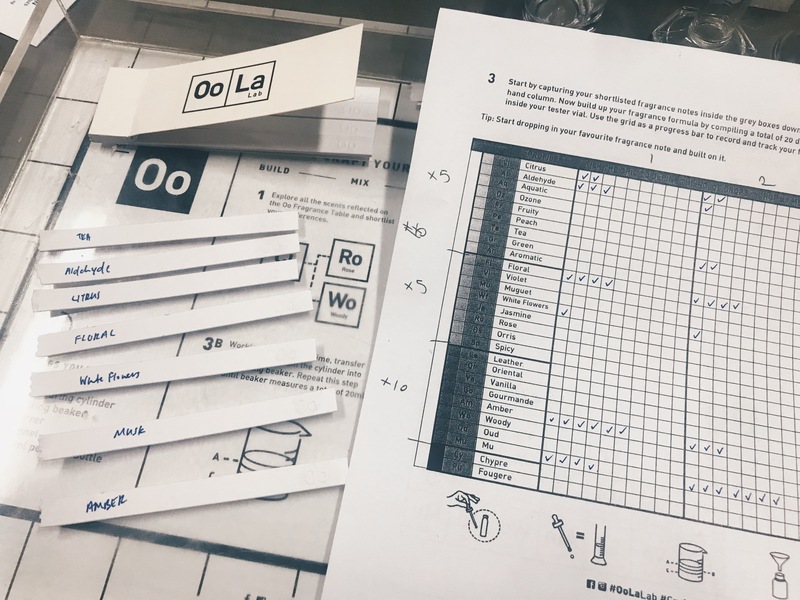 Here’s the slightly tedious part: Mark down the scents that you want to combine and decide how many drops of each scent will go into your trial mixture. This requires quite a bit of trial and error because you don’t want to leave the workshop smelling like a Funfetti Cake or the Amazon Rainforest. Now here’s where you get to feel like a chemist. Based on your prior selection, it was time to translate 20 drops into 20ml which is the amount needed to fill your perfume bottles! This step was important because an extra drop might change the entire formula of your perfume. The mixture in the bottle will then be iodised and topped up with alcohol, before being professionally sealed with a spray nozzle and cap. To make it even more personalised, you can name your perfume. Once that’s done, you’ll receive your 20ml eau de parfum packaged nicely in plastic wrappers with a card indicating your mixture so you can re-order on the website if you ever run out! If you’re ever looking at doing something out of the ordinary in Singapore, this workshop is perfect for a date or even as a birthday gift. You’d be surprised to find out how everyone’s preferences are so different. Who knows, you might just be able to recreate a perfume you love.